Burger King Japan is rolling out the limited edition, sliced squash embellished “BK Pumpkin” Whopper on October 26th, just in time for Halloween. Two slices of fried pumpkin not enough for you? Drop an extra 100 yen on the “Pumpkin Bomb”, a BK Pumpkin with 10 (count 'em, 10!) pumpkin slices. 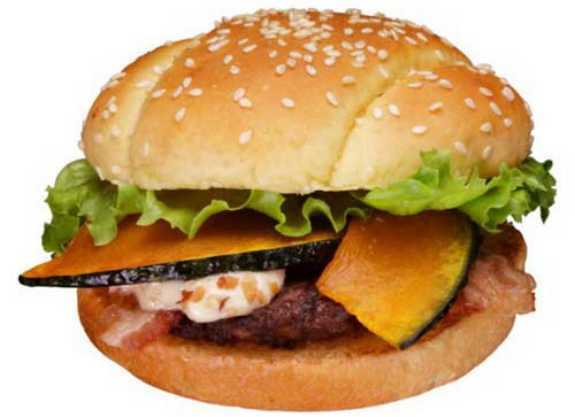 The BK Pumpkin, announced via an official press release from Burger King Japan, features thin slices of fried Kabocha squash – the Japanese call it “pumpkin” but it's actually a smaller, sweeter, meatier, green-skinned member of the gourd group. That's why we don't recommend hipster foodies on this side of the pond try recycling their leftover jack-o-lanterns come November 1st by creating their own modified Whoppers... yuk! But back to the BK Pumpkin, a frighteningly bold move by a fast-food conglomerate if ever there was. 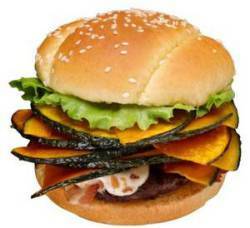 Burger King's beta carotene enhanced burger has been carefully crafted to reflect the many joys of a Japanese autumn. Lift off the unique double-slit sesame bun that sorta looks like a pumpkin and you'll find bacon, lettuce and a special nutty sauce made with almonds, cashews, hazelnuts, peanuts and sesame seeds complementing two slices of pumpkin and a beef patty. You gotta love it... or at least, Linus will. Speaking of pumpkin lovers, for an even more limited time (through November 17th to be exact), squash fanatics can drop the “Pumpkin Bomb”: a BK Pumpkin with 10 fried pumpkin slices costing an extra 100 yen (about $1.25). Not nuts for nuts? No problemo – BK's allowing you to add two slices of kabocha to ANY burger on the menu for an extra 60 yen (about 75 cents) per pair. Are Video Games Ready To Go Completely Digital? "Pumpkin Bomb only goes KABOO!" "...we don't recommend recycling leftover jack-o-lanterns...yuk"
I always recycle my jack-o’-lanterns as pie and everyone is pleased enough to ask for seconds (and thirds). Although decorative jack-o’-lanterns are rather watery and bland, but pumpkin pie is basically just a heavily spiced custard pie and it can be made from any kind of squash. Hell, I have served "pumpkin" pie made of zucchini with a few drops of orange food coloring and nobody was the wiser. Too true, Taro, but the soot from the burning candles and the globs of congealed wax tend to detract from the original flavor. I usually just leave ours for the neighborhood squirrels to finish off - they haven't complained yet.